Paris France Vacations day 2 of our 3 days in Paris. 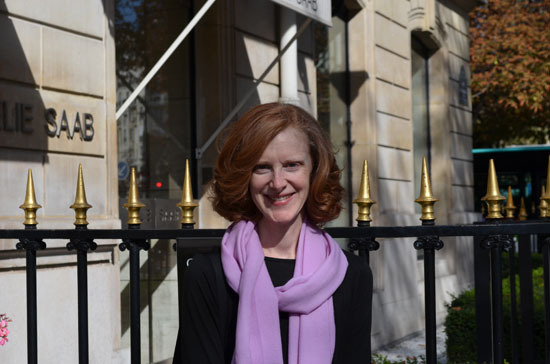 Got my hair cut at Jacques Dessanges, a luxury salon in the Champs Ellise/Tuilleries neighborhood. The salon is an extremely snooty environment. If you’re not up to it don’t go. I was late and came in apologizing and they just looked at me haughtily. If the greeter smiled she would have cracked her face into pieces I just know it. It didn’t used to be that way. Five years prior it was a quiet place and they were welcoming. They moved and redecorated, now they have attitude. Oh well. I go for the cut. 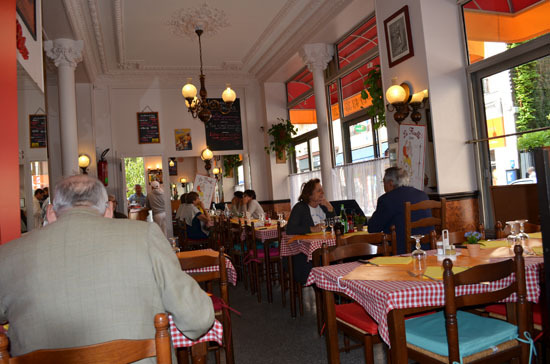 Next we took the RER Ille de France train line to Courbevoie where we met Uncle Felix for lunch. The RER are the regional France train lines. (You can take the RER to visit Fontenbleu and Versailles for example) But, Courbevoie is just over the river Seine, 7 minutes by express train. Courbevoie is a calm residential area with shops and restaurants. Had a fabulous lunch (the best food in Paris the entire visit) in one of Uncle’s favorite local bistros. I had the price fix lunch starting with half grapefruit filled with shrimp salad, then entrecote steak and frites. After lunch we visited Aunt Pirette who is well cared for in an assisted living facility. It was interesting to see how the French facilities compare to the places here at home. Similar and I suppose they are all different. Before dinner we went to a Baroque concert at Sainte Chapelle. 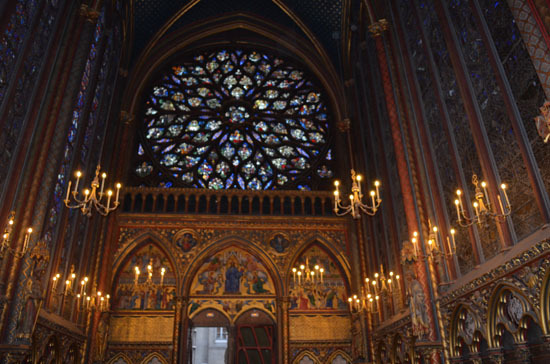 Sainte Chapelle is one of the top Paris France tourist attractions. There are tours of the church during the day. In the evening they have classical French music and other types of music. This concert featured a trio of Harpiscord, violin and antique flute. Gildas likes this kind of music and I, not so much. However, the experience of sitting in the church listening to well played music was fantastic. Ate in the Latin Quarter at an outdoor café. The food was just café food and not so special but the experience of sitting outside on a warm September night was very romantic. The weather in Paris France in early September is usually mild, which it was for us, making eating in Paris outside very comfortable. Plus, the Latin Quarter neighborhood is lively and was lots of fun to watch the action from outdoor table.